Legacy of Kings is basically a historical-fiction-fantasy with Alexander the Great’s childhood reimagined. Does that not scream marvellous and great (har har I couldn’t resist) things to you? IT DOES TO ME. It’s quite a dark gritty book. There is battle and blood everywhere and evil magic and snakes. Ugh to snakes. I’m a big fan of gritty fantasy, though, so I loved the darker tone and how it kept up the exciting fast pace. Oh, did I mention it has seven narrating characters? I KNOW. SEVEN. I hesitantly say it’s “too much”, although I did like most of the characters. But a few seemed superficial to the story line…but I assume they’ll become important in later books. A quick over view of these little narrators! ALEX: Obviously. I mean, he’s THE DUDE, right?! But he has an unfortunately small story line. I loved his character and would’ve liked more from him. HEPH: He was really easy to manipulate. Poor Heph. He’s Alex’s best friend…but their friendship really goes under fire. OLYMPIA: This is Alex’s mother, and I appreciate that we do get a peek at her POV. She is a subtle “villain”. She got up to some seriously freaky stuff…like, terrifying. Snakes. SNAKES IN HER HAIR. I am terrified of snakes. KAT: I wasn’t Kat’s biggest fan because she was super self-involved, never communicated properly, and was NOT loyal in the romance department. But she definitely had complex intentions and was interesting to read about! JACOB: He is Kat’s little childhood sweetheart. Aww. Except, Kat rejects him right at the start so I felt rather bad for him the entire book. CYN: She. was. AWESOME. I’m 99% sure she was a sociopath, and her manipulative and smooth talking skills were so captivating to read. ZO: What is the point of Zo? It is a myth to me. She’s supposedly Alex’s “betrothed”, but she runs away, gets caught by slavers, is a general naive munchkin. I will be curious about where here story goes in the sequels! I’m a huge fantasy nut, though, so despite the millions of narrators, I still couldn’t help but love the story! I adore grisly fantasy. And the story kept me captivated the entire time, I did not want to put it down. Plus fantasies are usually tiring to read…but I just found myself whipping through it easily! HUZZAH. The world building gets a big thumbs up too. It was interesting and lavish and I felt immersed, even though the book is only 430-pages long. The writing was just fantastic. There is also a gorgeously glorious map. To be honest, I think all books should have maps. 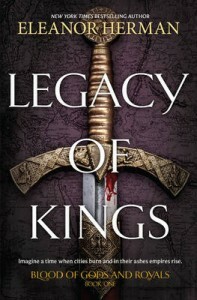 If you’re a fantasy fiend: Legacy of Kings is for you. It is! I had a few quibbles about the characters, but as I sit and stare at the book (as one does when finishing a novel) all I can focus on is what I adored. I wish I had book 2 right now. Hopefully it’ll have more of Alex’s story in there…because I want to see how this battle and strategy genius grows up. It’s such a unique premise, right?! Yay for historical-fiction fantasies!